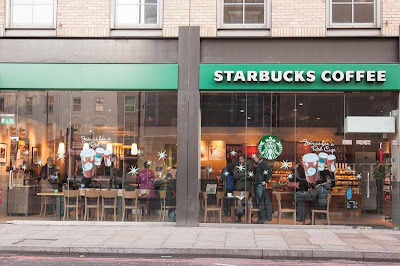 Starbucks hasn't paid any tax in the UK for the last 3 years. To highlight the "freetrade" coffee giants tax avoidance protesters will turn 44 branches into creches, refuges, and homeless shelters today. The company has announced it will make a tax payment of £10 million over the next two years. However, the protesters, like many of us do not believe that this "voluntary" payment resolves the bigger financial and ethical issues. Many large corporations in the UK are not paying a fair amount of tax and some are paying none at all!!! They really need to pay their fair share. I doubt very much that they are paying their fair share here either. I heard something about this on the radio this morning. I thought the company mentioned was McD's but it wouldn't surprise me if both are guilty. How can you pay no taxes!! Their 'new and improved'[sic] employment contracts leave something to be desired though! News like this make me so angry, especially then tax agencies go after individual wage earners so strictly yet allow large multi-billion corporations get away with it. Grrr. It's introduced this wonderful idea - voluntary taxation!